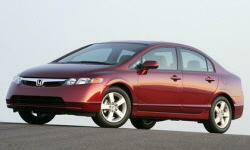 Honda Civic Reliability & Durability Pros and Cons | Page 1 of 3 | Why Not This Car? The only problem we ever had with this car was a bad front wheel hub and front pads at 42,000 miles. Everything else on this car was sturdy and worked well. I have had few to no reliability issues. There are regular wear items that when driven hard will wear out faster, but otherwise, these are relatively bullet-proof. Honda's engineers really know what they're doing. Reliability is good for a 10 year old car. I&#039;ve had the car for 4 years, and except for brakes, battery replacement , minor electrical issue, there haven&#039;t been any problems. Most parts are fairly cheap, They seem to last forever with proper care. I have owned 3 and they all have treated me well. Many of my friends have owned Civics of various trims and they always tend to excel in this area, with low maintenance costs. This is my fourth Civic and they have proven reliability. Came off the lot with many rattles and squeaks. Had to have both rear bearings replaced and had a third gear issue. Had to have transmission rebuilt to repair 3rd gear. There are few cars more reliable than a Civic. My experience has been justified - the only things I have replaced after nearly 40k miles have been wear parts.